The only program in the area that prepares students for both national exams, the CDIP from AHIMA and CCDS from ACDIS. Please visit organization websites for specific exam eligibility. Start this May, September, or January. 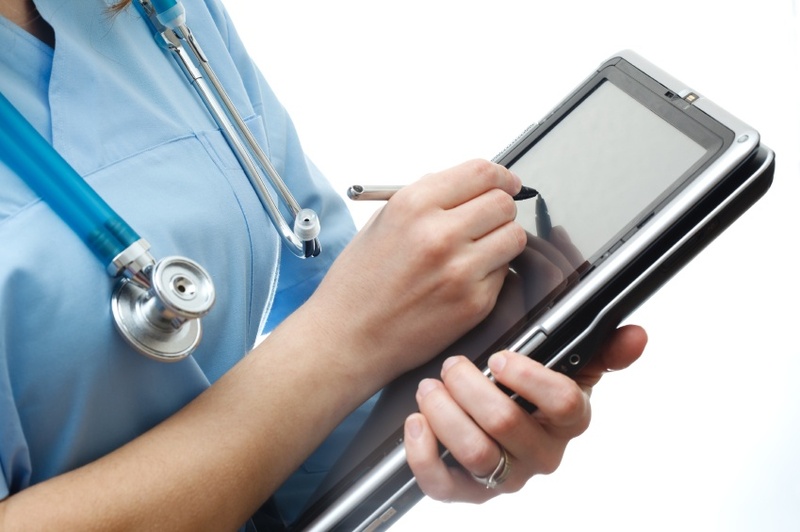 What is Clinical Documentation Improvement? 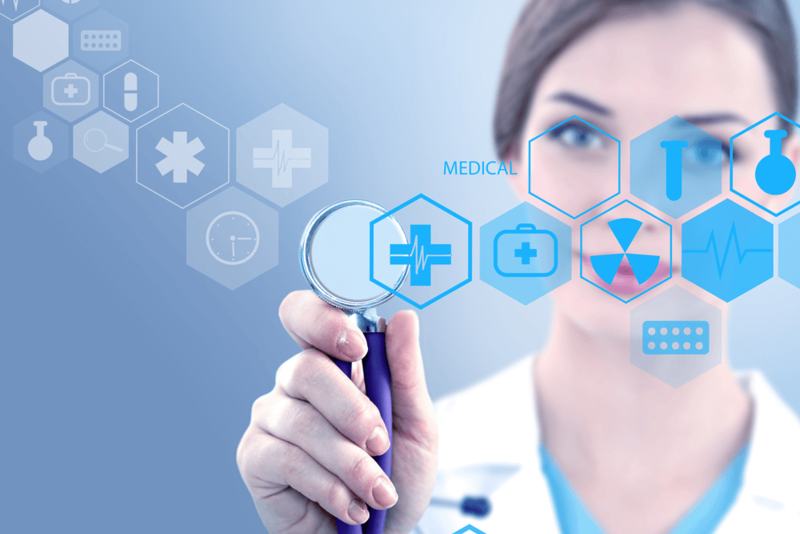 Clinical documentation professionals use codes such as ICD-10-CM and CPT to accurately report on the quality of patient care, healthcare services provided, and patient diagnosis and procedures for healthcare organizations. Individuals with clinical experience and an education in clinical documentation are critical members of today’s healthcare team. Certified CDI professionals are essential for reimbursement, quality measure reporting, and profiling. The growing need for this specialized skill set makes this an attractive career option for many nurses, doctors, and healthcare professionals. 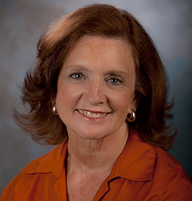 To meet the sharply rising employment need for CDI specialists, Elise developed this program and in doing so, introduced the first formal CDI program to the higher education market. Elise is available to answer questions you may have about this program. Contact admissions@laboure.edu if you would like to speak to Elise. Begin courses in May, September, or January. How is this program different from an accelerated bootcamp or webinar? Labouré’s program is different from webinar programs and boot camps because it is a college credit-bearing program. Labouré College’s CDI program stands alone in its structured, group approach to learning a new healthcare discipline in an online format. All courses are online and taught by nurses and doctors credentialed in CDI. The program includes weekly assignments, recorded lectures, hands-on practice activities, and discussion groups. Most importantly, the program provides students with an experienced instructor who is available to answer their questions. Students also have the opportunity to learn from fellow classmates with diverse professional backgrounds. Each of the four courses covers one or more of the six CDI core competency groups. The eight credits of academic coursework represents 120 hours of instruction and approximately 250 hours of reading or written assignments. In total, this program represents approximately 10 weeks of training. 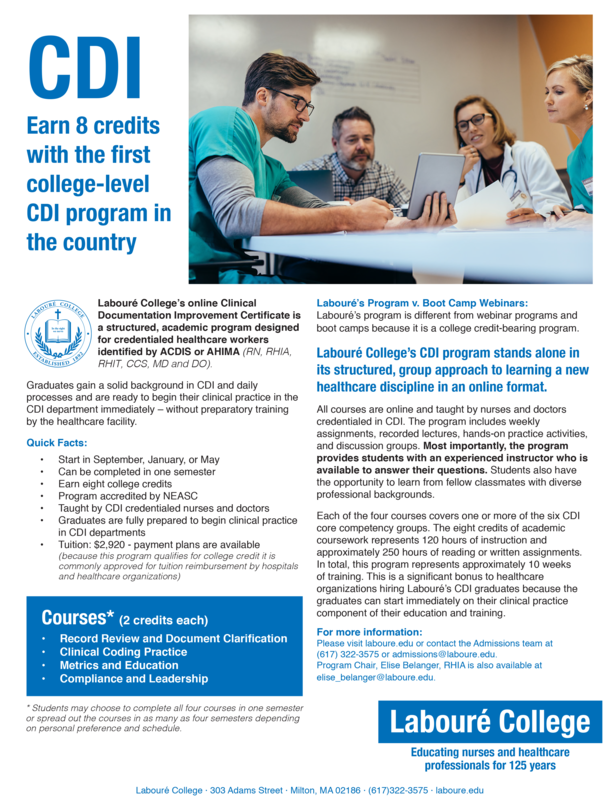 This is a significant bonus to healthcare organizations hiring Labouré’s CDI graduates because the graduates can start immediately on their clinical practice component of their education and training. Who should apply to the CDI program? It is beneficial for applicants to have a familiarity with Anatomy and Physiology, Diseases, and ICD-10-CM coding. If applicants do not have this background, the HIT Chairperson will advise on an individual basis. This program is awaiting NECHE approval as a substantive change to Labouré College’s academic programs. As a college with the distinct focus of education for practice in the health sector, we are committed to preparing individuals to deliver patient-centered care as members of an interdisciplinary team. The individual programs provide clinical education emphasizing evidence-based practice, including the latest research and clinical expertise. Quality improvement approaches and the use of information technology are important components of each program.